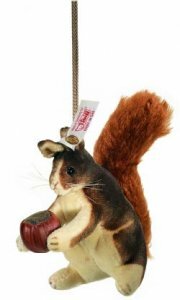 4", 2006, Cream and brown velvet squirrel, hand air brushed, red mohair bushy tail, holding a wooden acorn. Based on an original Steiff 1901 design which pre-dates the invention of the Teddy bear. Decorative Display Box and Certificate.